How many times have I said "never" or "never again" to myself and to friends. I am never going to: STOP there. Do not let it out unless you plan to watch yourself do just what you said would never happen. When I moved onto the first parsonage with out little family, I could see where bunk beds had been, and where a child had written the alphabet on the wall. In an instant "my children will never write on walls" came right out of my mouth. I did fairly well. They didn't....until one day I walked into the den to discover that 2-year-old Kay had drawn a HUGE happy face on the wall....with a black magic marker. She had never drawn anything that even looked like anything. Yet there it was. Not a tiny little string of letters penciled on a wall. A perfectly BIG happy face smiling right at me. When I asked her about it, she was so proud of what she had drawn, I was not about to punish her. I left it there, until it was time to move. I tried to paint over it and the face would come smiling through. Several coats later, I gave up. I invested in some epoxy to hide that smiling face. It still makes me smile. Meet Suzy Blue. 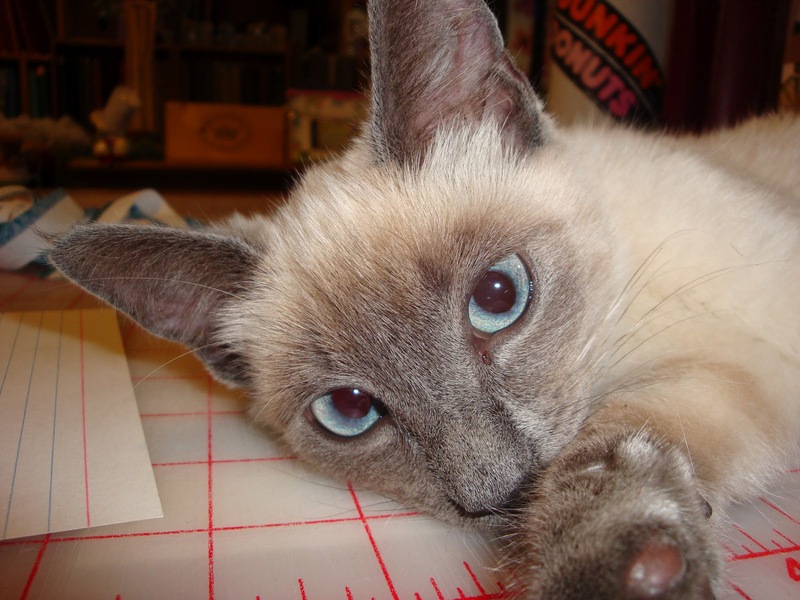 Kay was sewing in the studio and looked out the window to see baby blues eyes staring at her from under the box car. Kay's cat whisperer skills quickly surfaced, and soon there was a bowl of water and some scraps of food offered on the "porch" of the caboose. How is it that we some how attract unusual cats? This one is a Siamese kitten, maybe 5 months old. I am not a great gauge of animal's ages. A kitten for sure. Emma called her "Blue" when she saw her. It took us 1 day to get her to the door. Another day to get her to nibble on food, just inside the door. Day 3 she ventured in to explore the shop....everywhere, and then to run scared to her hiding place under the box car. Day 4, I moved the food and water in beside my desk. Still a very frightened kitten we could not even touch. She'd come to my feet purring loudly. When I reached for her, she was out the door! Day 5 a customer who was quicker that I am, scooped her up, and we checked to be sure she did not have an I.D. chip any where. That's when we determined she was Suzy Blue. Day 6 was Sunday, and I came in to the shop to invite her in to be fed. Monday was the same routine. Tuesday, I came with a box and litter, kitten food and a resolve to tame her. It really did not take very long. She is quickly learning her way around the shop. I have had a discussion with her about what she needs to do to be able to stay. No scratching or biting. Her "motor" runs easily. She comes to the counter where I am working, just to stretch out and watch. You have heard of the "cat in the hat". 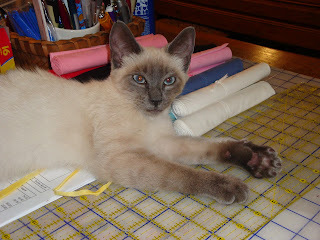 I have a cat-in-the-lap when I sit down to sew or design or work at the computer. And I am once again, totally taken in by a feline. I tell myself that I am doing my part for the SPCA. One kitten they do not have to process. I have decided that it is just fine to have to eat ones words. It means I am growing and learning. Some word salads are easier to eat than others. These words taste sweet when I remember a happy face smiling back at me from a much painted wall, or this time as a (formerly)stray Siamese kitten follows me around like a puppy and then curls up on my lap as I sew.